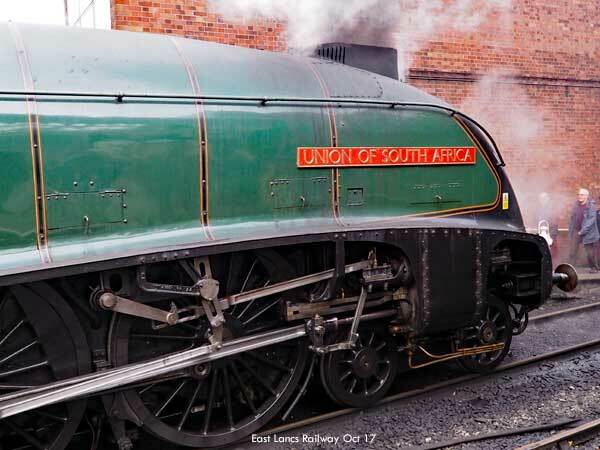 A visit to the ELR on Saturday 14th October for the Steam Event. Running were ex Southern 34092 City of Wells and ex-LNER 60009 Union of South Africa plus some local locos. We drove to Rawtenstall which is the nearest station and taking a wrong turning came upon a shopping area that has a big car park for the M&S Food, Aldi, Costa etc and a convenient path to the station. Tickets on a steam day are £13.20 each and we boarded the 10.30 hauled by 34092 which was looking very smart in dark green. Arriving at Ramsbottom it was found the loco had a ‘hot axle’ so after a short wait it was replaced by 52392 which must have been a big disappointment to the dozens of photographers strategically positioned on the hills along the track. Well I’m thinking that could have been me as I was thinking of getting some trackside shots. I wonder who owns the loco and how much it costs to do a repair like that. Arriving at Bury the train was 25 minutes late so emergency measures were taken for those who wanted to take Union of South Africa back. They were told to run across the track while stewards made sure they went safely. 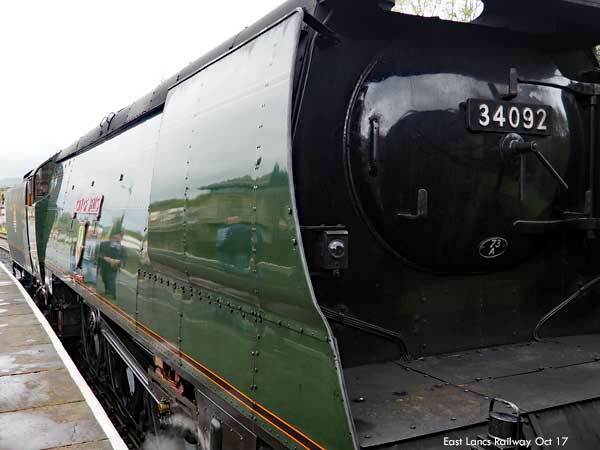 The platform was packed with enthusiasts and 60009 was looking magnificent, the shape of the loco, its curves are beautifully designed and metalwork beautifully formed. We stayed at on the station and had refreshment, there were a lot of stall holders selling railway memorabilia. Plenty of beer being drunk as well as the tea. We waited for 13000 to arrive and some exchange was done to haul the train to Heywood. We had intended to visit the Bury Transport Museum but had got behind schedule so decided to get the train back so we could visit The Whitaker Museum and Art Gallery in Rawtenstall. Getting back to the car we were able to do some shopping then drive to the Whitaker which is about half a mile from the station. It’s a smallish building in a park on the side of a hill. Formerly a mill owners house it contains a cafe, museum and art gallery. The cafe serves very good food and is quite stylish although service was slow on that day. It was busy. The art gallery had a local artist’s open display. The quality was high and obviously selective with prices also quite high. The museum is fairly small but interesting with some Horrocks displays similar to what I’ve seen at Queen Street Mill Museum in Burnley. The museum is good if you’re nearby but not worth a journey. Overall it was a good day and one that will be repeated although perhaps getting the 9.30 train would give more time as we like to be home by 4.